Horticulture Alarm Systems and Alarm Auto Diallers. A Horticulture company’s site normally contains one or multiple glass houses that they use to grow or ripen fruit, vegetables, flowers or plants. These products are then sold on to be eaten or planted. These products especially when young are very sensitive to their environmental conditions especially as more often then not the growers are forcing the plants to grow out of their normal seasons. Because of this it is critical to install an alarm system to monitor the environmental conditions of the glass house as even a small drop in temperature can kill off a whole seasons growing and cost the company thousands of pounds in left revenue. Of course there is no point in having an alarm system if it goes off at 1 o’clock in the morning and there is no one on site to hear it. 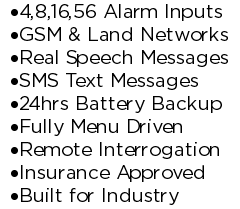 As most sites are not manned 247 and the owners/managers house is not on site you need a way to easily communicate the alarm to the correct on call personal. The best way to that is via an Alarm Auto Dialler, invented by Packs Infotel in 1958 – When the Alarm Auto Dialler detects an alarm signal either directly from the thermostats or via another system, it checks to see who the current on call staff are depending on the time of day & day of the week. It then sends a real speech message or text message detailing exactly what has happened so the staff can judge whether they need to rush in to deal with the problem or if it can wait for morning. The Alarm Dialler will continue to issue messages until a member of staff acknowledges they are going to deal with the alarm. By using a Industrial Alarm Auto Dialler with integrated battery backup and GSM phone line backup you can rest in the safe knowledge that even during a power cut and or phone line interruption you will get a phone call. You can also connect the Alarm Auto Dialler to your intruder alarms or lone worker systems to give you extra peace of mind and or to comply with health and safety regulations. For more Information please Contact Us or visit the Horticulture Autodialler System Page.